25 Oct Digital Invasions for the promotion of cultural heritage. Kick off meeting. After the Digital Journey, we started the Digital Invasion…. 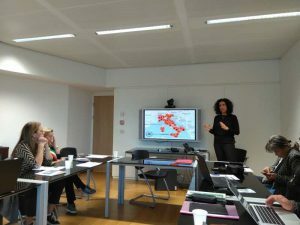 Following the 2018 ALL DIGITAL Summit, entitled Digital Journey: From Inclusion to Empowerment, a kick off meeting for the #DIGINV project Digital Invasions for the promotion of cultural heritage took place at the office for the representation of the Umbria Region to the EU. The DIGINV project was launched in 2018 to commemorate the European Year for Cultural Heritage. The project’s general objective is to promote the exchange of good practices for the involvement of citizens in the dissemination, enhancement and care of cultural heritage, through an innovative methodology, of Digital Invasions, based on the use of new communication technologies. The DIGINV project scales up the Digital Invasion methodology which was developed in Italy. The methodology improves the digital and communication skills of cultural operators, helping them become promoters to involved and engage citizens in the valorization of cultural heritage. The methodology also works to improve the digital skills of citizens involved (from the youngest to the elderly) by using new technologies to promote and valorize a cultural point of interest. The concept of the digital invasion project is to valorize cultural interest and practices by engages citizens, cultural institutions and using technology as a catalyst, in the end citizens engage and experience culture in a new way. The Digital Invasion concept methodology was presented by Marianna Marcucci at one of the sessions of the ALL DIGITAL Summit in Barcelona at 2017. 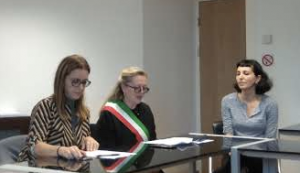 The kick off meeting was also attended by Gabriella Ceccarelli, representative of the Umbria Region in Brussels, and Annarita Falsacappa, major of the municipality of Bevagna who welcomed partners. Mayor Falsacappa gave a introductory speech to the projec t.
The project involves a partnership, which includes Telehaz (Hungary), Invasioni Digitali (Italy), Cyprus Computer Society, Malta Communications Authority, and CTK Rijeka (Croatia). Rijeka will be the European Capital of Culture in 2020 when the project ends. The project is coordinated by the municipality of Bevagna.